This way or that way? Where should we go? Up to the local shops or down to the playing fields? Let’s learn about our local community, looking at houses old and new and finding out how our streets have changed since our Mums and Dads were young. Perhaps your Granny or Grandpa lived locally or maybe they worked in the baker’s shop? Make maps and plans of the streets around us, planning our routes. What can you see? What can we find? Whereabouts do you live? Do you know your address? Find out how to write instructions, directions, adverts and learn rhymes all about our community from different times. 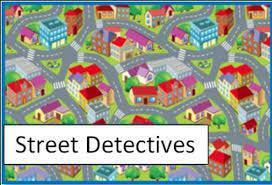 Ready to roll, Street Detectives?